For a dollar, you could opt for a bag of chips, a pop – or, at a vending machine in the North Loop, something colder and much more perishable. “Hand-packed by real Minnesotans. Take one home. Throw it at a friend,” the machine reads. Nick Nelson is one of those real Minnesotans. He and other staff at the advertising agency Space150 came up with the idea a couple months ago and have spent the past week packing and canning snowballs. The cans are dated, indicating snowball freshness. “You have to know when your snowball was made,” said Nelson, who has become a snowball expert. He uses his bare hands, covered in wax, to pack them and lets the snowballs sit for 24 to 48 hours in a shed to dry out before canning them. Many of the customers buying canned snowballs Thursday afternoon were locals, like Sara Whicher, who lives in Minnetonka. She planned to stow the $1 snowball in her office’s freezer then take it home to show her family. Amy Nelson, of Minneapolis, had a more creative idea for the dense snowball, which she said looks more like an ice ball: “make a fancy cocktail.” She joked with friends that they could take the snowball to Marvel Bar down the street and ask for a special drink. Others might have the same idea when an ice bar opens in the alley behind the Hewing Hotel on Thursday night. Whether they toss the snowball, drink it or leave it in the fridge, the purchase is going to a good cause, Nelson said, with all the proceeds going to local nonprofit Wilderness Inquiry. 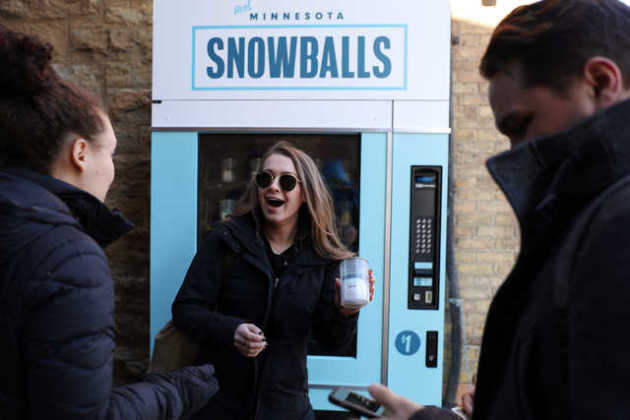 Allie Arends, with Space150, said they might bring the machine back out in July, but she hopes Super Bowl visitors appreciate the quirky Minnesota souvenir.